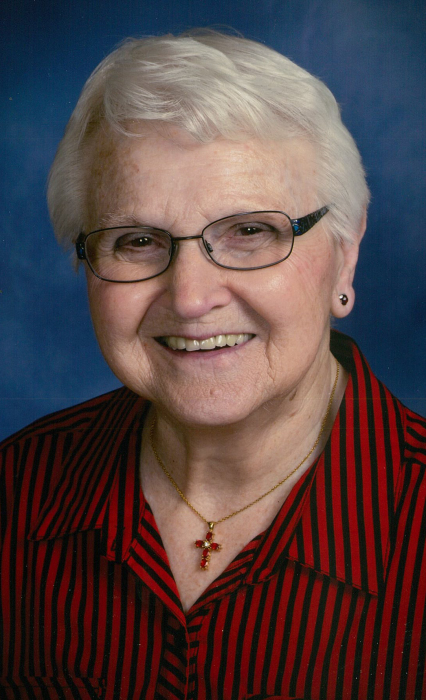 With heartfelt sadness, the family of Marianne B. Wolfe announces her passing on Thursday, April 4, 2019, at the age of 86. A long-time Fairfield resident, Marianne spent the last 3 years enjoying her life at the Hastings Homestead Assisted-Living facility where she was called by our Lord in Heaven to be our beautiful Angel. She was a loving and devoted Mother, Grandmother, Great-Grandmother and friend to all whose lives she touched. Rosary will be Friday, April 12, 2019; 10:30 A.M. at Our Lady of Assumption Catholic Church, 506 Liberty, Deweese, Nebraska. Mass of Christian Burial will follow at 11:00 A.M. with Father Tom Schultes officiating. Burial will be at Fairfield Cemetery, Fairfield, Nebraska. Visitation will be Thursday, April 11, 2019; 6:00 P.M. until 8:00 P.M. with family present at Our Lady of Assumption Catholic Church, Deweese. Memorials may be given to the Alzheimer's Research Foundation/Alzheimer's Association, the American Diabetes Association/Diabetes Research Institute, or Our Lady of Assumption Catholic Church. Marianne was born July 19, 1932, in Fairfield, Nebraska to Enos and Gladys (Frye) Mazour. She graduated from the Fairfield High School in 1949. She was joined in marriage to Marion Wolfe on October 25, 1949, at St. Martins (Loucky) Church west of Deweese, Nebraska. They enjoyed 62 memorable years together until Marion's passing in 2012. During her lifetime, Marianne kept very busy, but she was always available if needed. She was a member of Our Lady of Assumption Catholic Church and the Blue Bonnet Club. She very much loved her jobs driving a school bus for the Fairfield/Sandy Creek schools and working at the Horseshoe Inn in Deweese, but being Marion's "hired hand" on the Double Diamond Ranch kept her on her toes. On her time off, she loved to bowl, fish & hunt deer, go to the horse races & polka dances, tend her garden, play domino's & cards, but let's not forget, making sure that every stray cat & bird on the farm was feed well. She enjoyed attending the activities of her children, grandchildren and even great-grandchildren ... she was everyone's #1 fan. Just being around family and friends, sharing stories, joking and laughing was her biggest pleasure. She loved taking her grandchildren to Spring Ranch showing them where she grew up. She went way beyond for her family especially on the Holidays and she took such great delight in welcoming new additions & arrivals to our ever growing family tree. She was the best - a big heart, a little orneriness and a laugh that no one will ever forget. Her smile, her white hair, her hugs, her kindness .... she made a lasting impression on so many. A diamond in the rough ... may her sparkle forever shine upon us.